When you are trying to install a new program on Windows 10, you may receive an error message Windows Installer service could not be accessed. But don’t worry. This post will show you different ways to solve Windows Installer not working Windows 10 issue. It is an annoying thing that you can’t successfully install a new program on Windows 10/8/7. 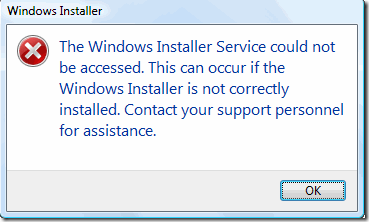 For example, you may receive an error message that says that Windows Installer service could not be accessed. As a matter of fact, many computer users complain that they have met this error message and they don’t know how to fix this Windows Installer error. This error may occur when Windows Installer files are damaged or missing. However, don’t worry. You have come to the right place. 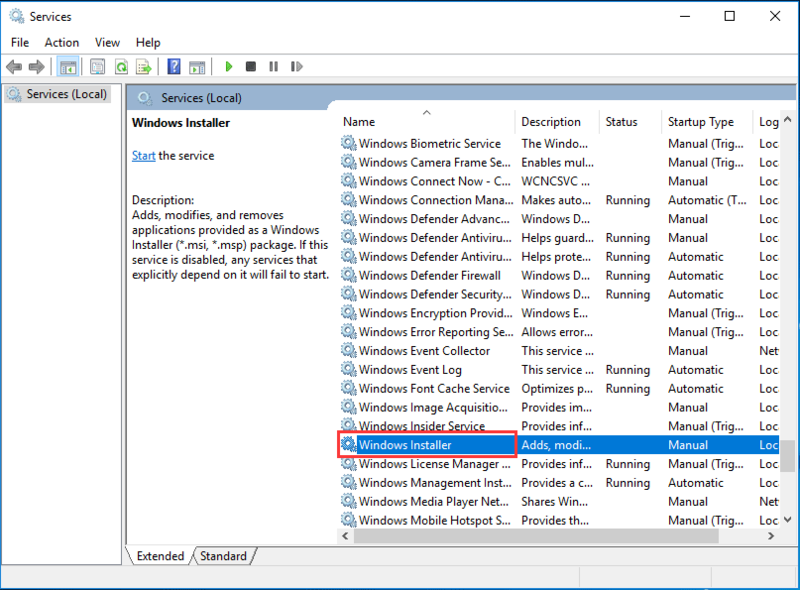 This article will introduce 4 ways to solve Windows Installer service cannot be accessed issue. You can try to use them one by one to fix Windows Installer error. Here, in this part, I will show you the 3 ways to solve Windows Installer service could not be accessed in detail. And each method is easy to operate. In order to solve Windows Installer service could not be accessed issue, it is recommended to remove the previous version of software since the old version of software always gives rise to some unexpected issues. And uninstalling the previous program always is an effective way to solve Windows Installer service could not be accessed issue. Furthermore, this method is pretty easy to operate. If you don’t know how to uninstall a piece of software, you can read the following instructions. Step 1: Type Control Panel in the search box of Windows 10 and click it to enter its main interface. Step 2: Click Programs and Features to continue. Then choose the program you want to remove and right-click it to choose Uninstall from the context menu. After you have successfully uninstalled the previous version of the software, you can reinstall the program to check whether the issue Windows Installer service could not be accessed is solved. If the first method is not working, you can go on to the second solution. Try to manually start Microsoft Installer Service to fix Windows Installer not working Windows 10 issue. Microsoft Installer is a utility application in the Windows operating system which is used to install, maintain or remove software. So when you meet Windows Installer service could not be accessed, you can try to check whether the Window Installer is stopped. Here, we will show you how to start Microsoft Installer Service step by step. Step 1: Press Windows key and R key together to launch the Run dialog. Then input services.msc in the Run box and click OK or hit Enter to continue. Step 2: Then the Service window will pop up. You need to choose Windows Installer to continue. Step 3: Double-click the Windows Installer service to go to Windows Installer Properties window. You need to change Service status from Stopped to Running by clicking Start button. After that, you can reboot your computer to check whether the issue Windows Installer service could not be accessed is solved. 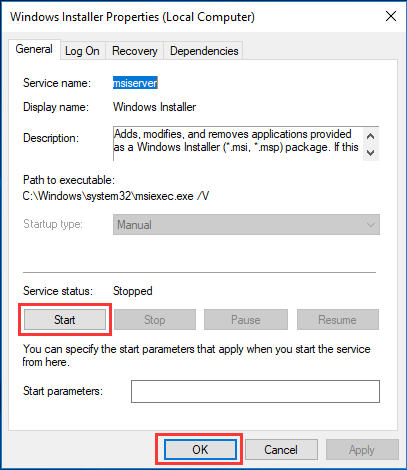 Now, you can go to the third method to fix Windows Installer error if the above two methods are failed. Then you can try to re-register Microsoft Installer Service. Then the detailed operations to re-register Microsoft Installer service are as follows. Step 1: Type cmd in the search box of Windows 10 and choose Command Prompt to continue. Step 2: In the Command Prompt window, you need to input the following commands and hit Enterafter each command to continue. Step 3: You can type exit command to close the command prompt window. 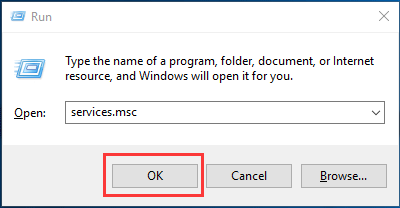 After you have finished above steps, you can restart your computer and reinstall the program to check whether the issue Windows Installer service cannot be accessed is solved. There are other methods that you can use as well. After you have solved the Windows Installer service could not be accessed issue, you had better create a system image to avoid the similar error in the coming days. With a system image, you can take advantage of it to restore to previous state instead of spending much time to solve the problem when you come across the similar issue again. And in fact, there are two ways to create a system image. On the one hand, Windows snap-in program can help you to create a system image, but on the other hand, you can use a piece of third-party software to create a system image. Here, I recommend MiniTool ShadowMaker. MiniTool ShadowMaker, the best backup software for Windows 10, is a good assistant to create a system image. With its various powerful features, it can back up the operating system, files and folders, disks, partitions and so on. In addition, it also has Restore feature which plays an essential role in performing recovery solutions. For instance, it can be used to restore computer to an earlier date when some accidents occur. And MiniTool ShadowMaker is an automatic tool which can safeguard your computer and data well. 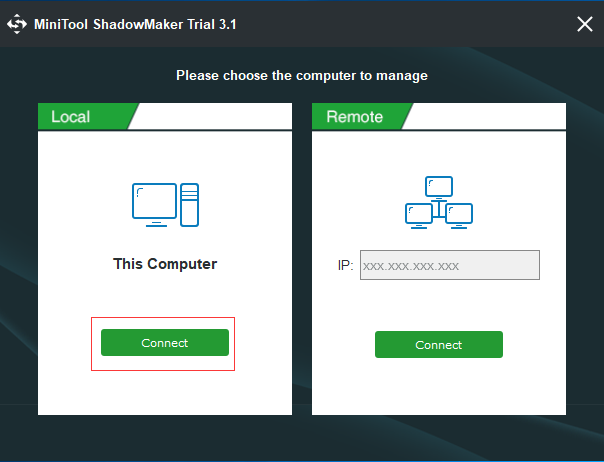 So as to create a system image to protect computer and data, you can download MiniTool ShadowMaker Trial which can be used for free within 30 days from following button. Now, I will show you how to back up Windows 10 with MiniTool ShadowMaker. Step 1: Install the backup tool and launch it. Then click Keep Trial. Then click Connect in the Local tab to enter its main interface. 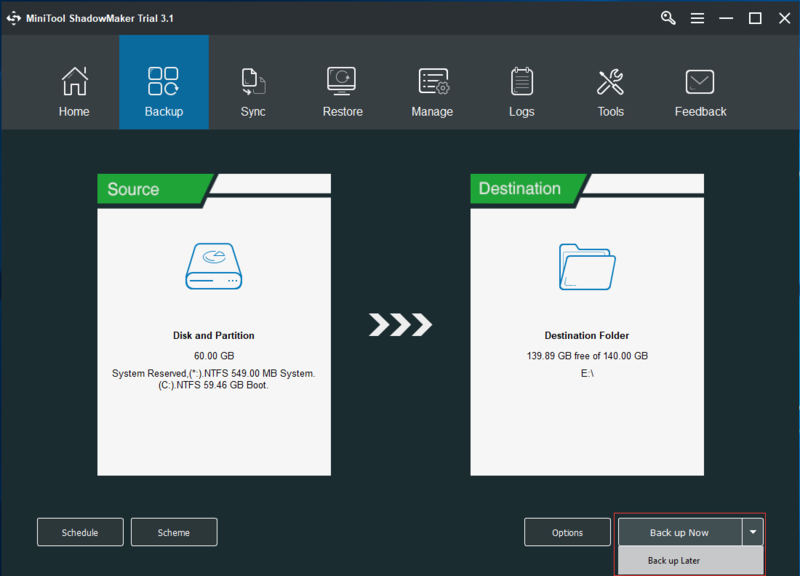 Step 2: MiniTool ShadowMaker will remind you to back up immediately if you haven’t used this software to perform any backup action. Thus, you just need to click SET UP BACKUP to continue. 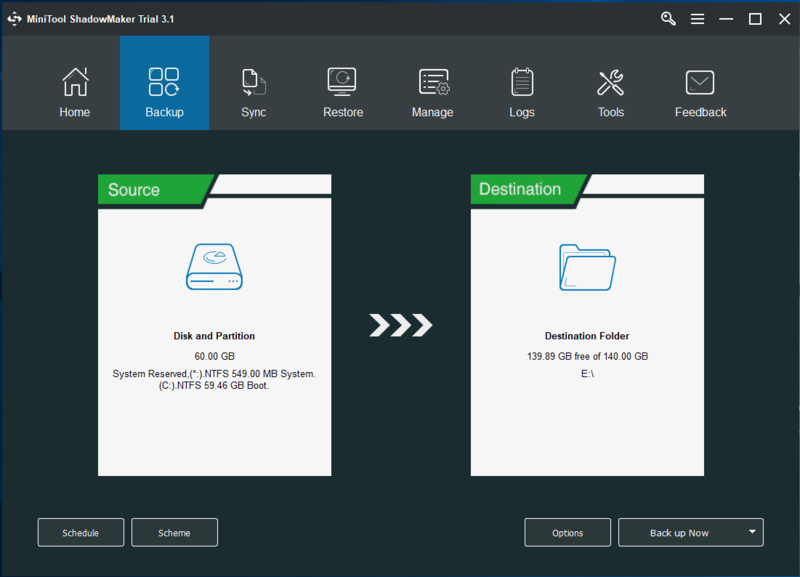 MiniTool ShadowMaker is designed to back up the operating system by default. In addition, you can also click Backup tab to enter the backup interface. Then you can click Source and Destination tabs to choose what you want to back up and decide where you want to save the backup image. Step 3: After that, you can click Back up Now to perform the action immediately. You can also choose Back up Later from the drop-down menu to delay the process. Read 3 Types of Backup: Full, Increment…ential – MiniTool to know more information on backup scheme. Step 4: After you have created a system image, you had better create a bootable mediathat is used to boot your computer into MiniTool Recovery Environment when your computer can’t normally boot from the operating system. Thus, you can go to Tools tab to choose Media Builder feature to continue. As you can see, the operation methods of creating a system image by MiniTool ShadowMaker are pretty easy. Thus, you can download it to create a system image for the sake of protecting your PC and data well. I have introduced solutions to the issue the Windows Installer service could not be accessed. You can choose any one to solve Window Installer not working problem. And if you have any better solution you can share it on the comment zone. In addition, it is recommended to create a system image so as to perform some recovery solutions when encountering some accidents.